British Columbia’s largest university campus released its draft policy earlier this month covering where cannabis smoking will be permitted come legalization, and unlike a number of other campuses nationwide, it may not be going smoke-free. This is partly to do with the challenge of enforcing such a prohibition on the University of British Columbia’s nearly thousand-acre grounds, said Michael Serebriakov, legal counsel at UBC. “Through our review and research we discovered that any time you do a ban on an otherwise legal activity, it will end up just driving the behaviour underground,” Serebriakov said in an interview. At least 65 Canadian universities and colleges have adopted wholesale smoking prohibitions both indoors and out, according to a September report from the Canadian Cancer Society. In B.C., Langara College, Douglas College and the Surrey, Richmond, Cloverdale and Langley campuses of Kwantlen Polytechnic University have all adopted such policies this year. A campuswide smoking ban will also come into effect on the University of the Fraser Valley’s Abbotsford, Chilliwack, Mission and Hope campuses on October 1. 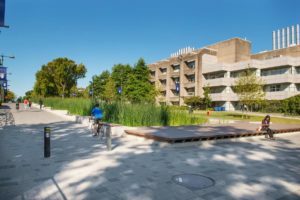 But Serebriakov said developing regulations around cannabis smoking on UBC’s Vancouver campus required the university’s Marijuana Policy Development Committee to weigh other, unique considerations, including the campus’ proximity to residential neighbourhoods.